Kate is a Senior Lecturer in Biomedical Neuroscience. Her long standing research interest is focused on understanding how the brain controls food intake and body weight. Kate has over fourteen years of experience in this area from work at Universities in the USA and UK. Currently her research is funded by the Medical Research Council, the Juvenile Diabetes Research Foundation, and the British Society for Neuroendocrinology. Kate teaches on both the Medicine and Medical Sciences programmes. In addition to lecturing, she is the academic lead for intercalated degrees, the Medical School subject co-ordinator for Flexible Combined Honours, and module lead for the final year Neuropharmacology course in Medical Sciences. Kate is committed to mentoring students and is enthusiastic about promoting careers in research and academic medicine. After completing a PhD at the University of Manchester under the supervision of Profs. Nancy Rothwell and Simon Luckman she was awarded a Wellcome Trust post-doctoral travelling fellowship to study with Dr Roger Cone at the Vollum Institute in Portland, Oregon, USA. Kate remained in Oregon until 2008 when she joined the faculty Vanderbilt University Medical Center in Nashville, Tennessee and started an independent research programme examining the effect of obesity on central nervous system function. While at Vanderbilt, Kate also served as Associate Director of the Metabolic Pathophysiology Core of the Vanderbilt Mouse Metabolic Phenotyping Center. Kate joined the University of Exeter Medical School in 2014 as a Senior Lecturer (Education & Research). Kate's broad research interest is understanding how the brain controls food intake and body weight. In particular her research is focused on how different cell types in the brain (neurons, microglia, astrocytes and endothelial cells) coordinate and interact to regulate these processes. 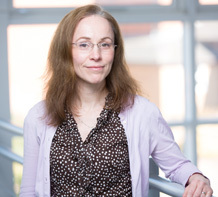 Her lab also studies how the normal function of the brain changes in response to alterations in body weight including obesity (excess body weight) and anorexia/cachexia (insufficient body weight), and how these changes in the brain contribute to the development of commonly associated diseases like diabetes. Obesity, a major public health issue in the U.K. that affects greater than 25% of the adult population. It is estimated to directly cost the National Health Service (NHS) £4.2billion each year and can affect all aspects of a person’s life. Currently there are limited treatment options available. The long term goal of Kate's research is to impact human health by improving our knowledge of how the brain controls food intake and body weight, which will help in the development of new therapies for obesity and anorexia/cachexia. regulation of energy homeostasis in mice"
Goal: To investigate the potential role of 18kDa Translocator protein (TSPO) in mediating homeostatic changes in food intake and body weight. Goal: To evaluate the efficacy of an orally active AMPK activator as a potential therapeutic agent to improve hypoglycemia sensing in type 1 diabetes. Goal: The goal of this project is to test the hypothesis that TSPO functions as a docking protein in the outer mitochondrial membrane which binds ACBP allowing it to present fatty acyl-CoA to CPT-1 for transport across the mitochondrial membrane for utilization in β-oxidation. Goal: To characterize changes in the electrophysiological properties of hypothalamic neurons with disease progression in Alzheimer's disease. Title: Does an orally active, brain permeable AMPK activator improve hypoglycemia counterregulation in type 1 diabetes? Vlachaki Walker JM, Robb JL, Cruz AM, Malhi A, Weightman Potter PG, Ashford ML, McCrimmon RJ, Ellacott KL, Beall C (In Press). AMP-activated protein kinase activator A-769662 increases intracellular calcium and ATP release from astrocytes in an AMPK-independent manner. Diabetes, Obesity and Metabolism Full text. Weightman Potter P, Vlachaki Walker J, Robb J, Chilton J, Williamson R, Randall A, Ellacott K, Beall C (In Press). Basal fatty acid oxidation increases after recurrent low glucose in human primary astrocytes. Diabetologia Full text. Ghamari-Langroudi M, Cakir I, Lippert RN, Sweeney P, Litt MJ, Ellacott KLJ, Cone RD (In Press). Regulation of energy rheostasis by the melanocortin-3 receptor. Science Advances Full text. Buckman LB, Thompson MM, Lippert RN, Blackwell TS, Yull FE, Ellacott KLJ (2015). Evidence for a novel functional role of astrocytes in the acute homeostatic response to high-fat diet intake in mice. Mol Metab, 4(1), 58-63. Buckman LB, Hasty AH, Flaherty DK, Buckman CT, Thompson MM, Matlock BK, Weller K, Ellacott KLJ (2014). Obesity induced by a high-fat diet is associated with increased immune cell entry into the central nervous system. Brain Behav Immun, 35, 33-42. Obesity induced by a high-fat diet is associated with increased immune cell entry into the central nervous system. Obesity is associated with chronic low-grade inflammation in peripheral tissues caused, in part, by the recruitment of inflammatory monocytes into adipose tissue. Studies in rodent models have also shown increased inflammation in the central nervous system (CNS) during obesity. The goal of this study was to determine whether obesity is associated with recruitment of peripheral immune cells into the CNS. To do this we used a bone marrow chimerism model to track the entry of green-fluorescent protein (GFP) labeled peripheral immune cells into the CNS. Flow cytometry was used to quantify the number of GFP(+) immune cells recruited into the CNS of mice fed a high-fat diet compared to standard chow fed controls. High-fat feeding resulted in obesity associated with a 30% increase in the number of GFP(+) cells in the CNS compared to control mice. Greater than 80% of the GFP(+) cells recruited to the CNS were also CD45(+) CD11b(+) indicating that the GFP(+) cells displayed characteristics of microglia/macrophages. Immunohistochemistry further confirmed the increase in GFP(+) cells in the CNS of the high-fat fed group and also indicated that 93% of the recruited cells were found in the parenchyma and had a stellate morphology. These findings indicate that peripheral immune cells can be recruited to the CNS in obesity and may contribute to the inflammatory response. The contribution of hypothalamic macroglia to the regulation of energy homeostasis. The hypothalamus is critical for the regulation of energy homeostasis. Genetic and pharmacologic studies have identified a number of key hypothalamic neuronal circuits that integrate signals controlling food intake and energy expenditure. Recently, studies have begun to emerge demonstrating a role for non-neuronal cell types in the regulation of energy homeostasis. In particular the potential importance of different glial cell types is increasingly being recognized. A number of studies have described changes in the activity of hypothalamic macroglia (principally astrocytes and tanycytes) in response to states of positive and negative energy balance, such as obesity and fasting. This article will review these studies and discuss how these findings are changing our understanding of the cellular mechanisms by which energy homeostasis is regulated. Beall C, Hanna L, Ellacott KLJ (In Press). CNS targets of adipokines. Comprehensive Physiology Full text. Lippert RN, Ellacott KLJ, Cone RD (2014). Gender-specific roles for the melanocortin-3 receptor in the regulation of the mesolimbic dopamine system in mice. Endocrinology, 155(5), 1718-1727. Gender-specific roles for the melanocortin-3 receptor in the regulation of the mesolimbic dopamine system in mice. The melanocortin-3 receptor (MC3R) and MC4R are known to play critical roles in energy homeostasis. However, the physiological functions of the MC3R remain poorly understood. Earlier reports indicated that the ventral tegmental area (VTA) is one of the highest sites of MC3R expression, and we sought to determine the function of the receptor in this brain region. A MC3R-green-fluorescent protein transgenic mouse and a MC3R knockout mouse strain were used to characterize the neurochemical identity of the MC3R neurons in the VTA and to determine the effects of global MC3R deletion on VTA dopamine (DA) homeostasis. We demonstrate that the MC3R, but not MC4R, is expressed in up to a third of dopaminergic neurons of the VTA. Global deletion of the MC3R increases total dopamine by 42% in the VTA and decreases sucrose intake and preference in female but not male mice. Ovariectomy restores dopamine levels to normal, but aberrant decreased VTA dopamine levels are also observed in prepubertal female mice. Because arcuate Agouti-related peptide/neuropeptide Y neurons are known to innervate and regulate VTA signaling, the MC3R in dopaminergic neurons provides a specific input for communication of nutritional state within the mesolimbic dopamine system. Data provided here suggest that this input may be highly sexually dimorphic, functioning as a specific circuit regulating effects of estrogen on VTA dopamine levels and on sucrose preference. Overall, this data support a sexually dimorphic function of MC3R in regulation of the mesolimbic dopaminergic system and reward. Buckman LB, Anderson-Baucum EK, Hasty AH, Ellacott KL (2014). Regulation of S100B in white adipose tissue by obesity in mice. Adipocyte, 3(3), 215-220. Regulation of S100B in white adipose tissue by obesity in mice. S100B is a calcium binding protein found in adipose tissue; however, relatively little is known about the physiologic regulation or distribution of the protein within this organ. We examined plasma S100B concentration and white adipose tissue (WAT) s100b mRNA levels in lean and diet-induced obese (DIO) mice. Plasma S100B levels were increased by obesity. In WAT, s100b gene expression was also significantly increased by obesity and this increase was reversed following weight-loss. s100b gene expression was detected in both the adipocyte-enriched and stromal-vascular fractions of WAT; however, the increase in s100b gene expression in obese animals was only detected in the adipocyte-enriched fraction. Our results support published in vitro data indicating that WAT S100B may contribute to obesity-associated inflammation. Pendergast JS, Branecky KL, Yang W, Ellacott KLJ, Niswender KD, Yamazaki S (2013). High-fat diet acutely affects circadian organisation and eating behavior. Eur J Neurosci, 37(8), 1350-1356. High-fat diet acutely affects circadian organisation and eating behavior. The organisation of timing in mammalian circadian clocks optimally coordinates behavior and physiology with daily environmental cycles. Chronic consumption of a high-fat diet alters circadian rhythms, but the acute effects on circadian organisation are unknown. To investigate the proximate effects of a high-fat diet on circadian physiology, we examined the phase relationship between central and peripheral clocks in mice fed a high-fat diet for 1 week. By 7 days, the phase of the liver rhythm was markedly advanced (by 5 h), whereas rhythms in other tissues were not affected. In addition, immediately upon consumption of a high-fat diet, the daily rhythm of eating behavior was altered. As the tissue rhythm of the suprachiasmatic nucleus was not affected by 1 week of high-fat diet consumption, the brain nuclei mediating the effect of a high-fat diet on eating behavior are likely to be downstream of the suprachiasmatic nucleus. Neurovascular unit on a chip: implications for translational applications. The blood-brain barrier (BBB) dynamically controls exchange between the brain and the body, but this interaction cannot be studied directly in the intact human brain or sufficiently represented by animal models. Most existing in vitro BBB models do not include neurons and glia with other BBB elements and do not adequately predict drug efficacy and toxicity. Under the National Institutes of Health Microtissue Initiative, we are developing a three-dimensional, multicompartment, organotypic microphysiological system representative of a neurovascular unit of the brain. The neurovascular unit system will serve as a model to study interactions between the central nervous system neurons and the cerebral spinal fluid (CSF) compartment, all coupled to a realistic blood-surrogate supply and venous return system that also incorporates circulating immune cells and the choroid plexus. Hence all three critical brain barriers will be recapitulated: blood-brain, brain-CSF, and blood-CSF. Primary and stem cell-derived human cells will interact with a variety of agents to produce critical chemical communications across the BBB and between brain regions. Cytomegalovirus, a common herpesvirus, will be used as an initial model of infections regulated by the BBB. This novel technological platform, which combines innovative microfluidics, cell culture, analytical instruments, bioinformatics, control theory, neuroscience, and drug discovery, will replicate chemical communication, molecular trafficking, and inflammation in the brain. The platform will enable targeted and clinically relevant nutritional and pharmacologic interventions for or prevention of such chronic diseases as obesity and acute injury such as stroke, and will uncover potential adverse effects of drugs. If successful, this project will produce clinically useful technologies and reveal new insights into how the brain receives, modifies, and is affected by drugs, other neurotropic agents, and diseases. Buckman LB, Thompson MM, Moreno HN, Ellacott KLJ (2013). Regional astrogliosis in the mouse hypothalamus in response to obesity. J Comp Neurol, 521(6), 1322-1333. Regional astrogliosis in the mouse hypothalamus in response to obesity. Obesity is associated with chronic low-grade inflammation in peripheral tissues, which contributes to the development of comorbidities such as insulin resistance and cardiovascular disease. While less extensively characterized, obesity also promotes inflammation in the central nervous system (CNS) and the consequences of this inflammation for CNS function are only beginning to be examined. In response to CNS insults such as inflammation, astrocytes undergo a process of hypertrophy and hyperplasia known as reactive astrogliosis. We used immunohistochemistry to examine the differential distribution of the astrocyte marker glial-fibrillary acidic protein (GFAP) in the brains of diet-induced or genetically obese mice compared with their respective lean controls to determine whether different nuclei of the hypothalamus showed comparable astrogliosis in response to obesity. The areas that showed the highest differential GFAP immunoreactivity between lean and obese animals include the medial preoptic, paraventricular, and dorsomedial nuclei. Comparatively, little astrogliosis was seen in the ventromedial nucleus, lateral hypothalamus, or anterior hypothalamic area. In obese animals high levels of GFAP immunoreactivity were often associated with the microvasculature. There were no differences in the differential distribution of GFAP staining between obese animals and their lean controls in the diet-induced compared with the genetic model of obesity. The exact cause(s) of the astrogliosis in obesity is not known. The finding that obesity causes a distinct pattern of elevated GFAP immunoreactivity associated with microvessels suggests that the astrogliosis may be occurring as a response to changes at the blood-brain barrier and/or in the peripheral circulation. Thompson MM, Manning HC, Ellacott KLJ (2013). Translocator protein 18 kDa (TSPO) is regulated in white and brown adipose tissue by obesity. PLoS One, 8(11). Translocator protein 18 kDa (TSPO) is regulated in white and brown adipose tissue by obesity. Translocator protein 18 kDa (TSPO) is an outer-mitochondrial membrane transporter which has many functions including participation in the mitochondrial permeability transition pore, regulation of reactive oxygen species (ROS), production of cellular energy, and is the rate-limiting step in the uptake of cholesterol. TSPO expression is dysregulated during disease pathologies involving changes in tissue energy demands such as cancer, and is up-regulated in activated macrophages during the inflammatory response. Obesity is associated with decreased energy expenditure, mitochondrial dysfunction, and chronic low-grade inflammation which collectively contribute to the development of the Metabolic Syndrome. Therefore, we hypothesized that dysregulation of TSPO in adipose tissue may be a feature of disease pathology in obesity. Radioligand binding studies revealed a significant reduction in TSPO ligand binding sites in mitochondrial extracts from both white (WAT) and brown adipose tissue (BAT) in mouse models of obesity (diet-induced and genetic) compared to control animals. We also confirmed a reduction in TSPO gene expression in whole tissue extracts from WAT and BAT. Immunohistochemistry in WAT confirmed TSPO expression in adipocytes but also revealed high-levels of TSPO expression in WAT macrophages in obese animals. No changes in TSPO expression were observed in WAT or BAT after a 17 hour fast or 4 hour cold exposure. Treatment of mice with the TSPO ligand PK11195 resulted in regulation of metabolic genes in WAT. Together, these results suggest a potential role for TSPO in mediating adipose tissue homeostasis. Renquist BJ, Murphy JG, Larson EA, Olsen D, Klein RF, Ellacott KLJ, Cone RD (2012). Melanocortin-3 receptor regulates the normal fasting response. Proc Natl Acad Sci U S A, 109(23), E1489-E1498. Melanocortin-3 receptor regulates the normal fasting response. The melanocortin-3 receptor-deficient (MC3-R(-/-)) mouse exhibits mild obesity without hyperphagia or hypometabolism. MC3-R deletion is reported to increase adiposity, reduce lean mass and white adipose tissue inflammation, and increase sensitivity to salt-induced hypertension. We show here that the MC3-R(-/-) mouse exhibits defective fasting-induced white adipose tissue lipolysis, fasting-induced liver triglyceride accumulation, fasting-induced refeeding, and fasting-induced regulation of the adipostatic and hypothalamic-adrenal-pituitary axes. Close examination of the hypothalamic-pituitary-adrenal axis showed that MC3-R(-/-) mice exhibit elevated nadir corticosterone as well as a blunted fasting-induced activation of the axis. The previously described phenotypes of this animal and the reduced bone density reported here parallel those of Cushing syndrome. Thus, MC3-R is required for communicating nutritional status to both central and peripheral tissues involved in nutrient partitioning, and this defect explains much of the metabolic phenotype in the model. Hatoum IJ, Stylopoulos N, Vanhoose AM, Boyd KL, Yin DP, Ellacott KLJ, Ma LL, Blaszczyk K, Keogh JM, Cone RD, et al (2012). Melanocortin-4 receptor signaling is required for weight loss after gastric bypass surgery. J Clin Endocrinol Metab, 97(6), E1023-E1031. Melanocortin-4 receptor signaling is required for weight loss after gastric bypass surgery. CONTEXT: Roux-en-Y gastric bypass (RYGB) is one of the most effective long-term therapies for the treatment of severe obesity. Recent evidence indicates that RYGB effects weight loss through multiple physiological mechanisms, including changes in energy expenditure, food intake, food preference, and reward pathways. OBJECTIVE: Because central melanocortin signaling plays an important role in the regulation of energy homeostasis, we investigated whether genetic disruption of the melanocortin-4 receptor (MC4R) in rodents and humans affects weight loss after RYGB. METHODS AND RESULTS: Here we report that MC4R(-/-) mice lost substantially less weight after surgery than wild-type animals, indicating that MC4R signaling is necessary for the weight loss effects of RYGB in this model. Mice heterozygous for MC4R remain fully responsive to gastric bypass. To determine whether mutations affect surgically induced weight loss in humans, we sequenced the MC4R gene in 972 patients undergoing RYGB. Patients heterozygous for MC4R mutations exhibited the same magnitude and distribution of postoperative weight loss as patients without such mutations, suggesting that although two normal copies of the MC4R gene are necessary for normal weight regulation, a single normal copy of the MC4R gene is sufficient to mediate the weight loss effects of RYGB. CONCLUSIONS: MC4R is the first gene identified that is required for the sustained effects of bariatric surgery. The need for MC4R signaling for the weight loss effects of RYGB in mice underscores the physiological mechanisms of action of this procedure and demonstrates that RYGB both influences and is dependent on the normal pathways that regulate energy balance. Orr JS, Puglisi MJ, Ellacott KLJ, Lumeng CN, Wasserman DH, Hasty AH (2012). Toll-like receptor 4 deficiency promotes the alternative activation of adipose tissue macrophages. Diabetes, 61(11), 2718-2727. Toll-like receptor 4 deficiency promotes the alternative activation of adipose tissue macrophages. Obesity is characterized by adipose tissue (AT) macrophage (ATM) accumulation, which promotes AT inflammation and dysfunction. Toll-like receptor 4 (TLR4) deficiency attenuates AT inflammation in obesity but does not impede the accumulation of ATMs. The purpose of the current study was to determine whether TLR4 deficiency alters ATM polarization. TLR4(-/-) and wild-type mice were fed a low-fat, high-monounsaturated fat (HF(MUFA)), or a high-saturated fat (HF(SFA)) diet for 16 weeks. Further, we used a bone marrow transplant model to determine the influence of hematopoietic cell TLR4 signaling. The metabolic and inflammatory responses to high-fat feeding and ATM phenotype were assessed. Global and hematopoietic cell TLR4 deficiency, irrespective of recipient genotype, produced a shift in ATM phenotype toward an alternatively activated state, which was accompanied by reduced AT inflammation. Despite the observed shift in ATM phenotype, neither global nor hematopoietic cell TLR4 deficiency influenced systemic insulin sensitivity after high-fat feeding. Results of the current study suggest that TLR4 directly influences ATM polarization but question the relevance of TLR4 signaling to systemic glucose homeostasis in obesity. Srisai D, Gillum MP, Panaro BL, Zhang X-M, Kotchabhakdi N, Shulman GI, Ellacott KLJ, Cone RD (2011). Characterization of the hyperphagic response to dietary fat in the MC4R knockout mouse. Endocrinology, 152(3), 890-902. Characterization of the hyperphagic response to dietary fat in the MC4R knockout mouse. Defective melanocortin signaling causes hyperphagic obesity in humans and the melanocortin-4 receptor knockout mouse (MC4R(-/-)). The human disease most commonly presents, however, as haploinsufficiency of the MC4R. This study validates the MC4R(+/-) mouse as a model of the human disease in that, like the MC4R(-/-), the MC4R(+/-) mouse also exhibits a sustained hyperphagic response to dietary fat. Furthermore, both saturated and monounsaturated fats elicit this response. N-acylphosphatidylethanolamine (NAPE) is a signaling lipid induced after several hours of high-fat feeding, that, if dysregulated, might explain the feeding behavior in melanocortin obesity syndrome. Remarkably, however, MC4R(-/-) mice produce elevated levels of NAPE and are fully responsive to the anorexigenic activity of NAPE and oleoylethanolamide. Interestingly, additional differences in N-acylethanolamine (NAE) biochemistry were seen in MC4R(-/-) animals, including reduced plasma NAE levels and elevated hypothalamic levels of fatty acid amide hydrolase expression. Thus, while reduced expression of NAPE or NAE does not explain the high-fat hyperphagia in the melanocortin obesity syndrome, alterations in this family of signaling lipids are evident. Analysis of the microstructure of feeding behavior in response to dietary fat in the MC4R(-/-) and MC4R(+/-) mice indicates that the high-fat hyperphagia involves defective satiation and an increased rate of food intake, suggesting defective satiety signaling and enhanced reward value of dietary fat. Renquist BJ, Lippert RN, Sebag JA, Ellacott KLJ, Cone RD (2011). Physiological roles of the melanocortin MC₃ receptor. Eur J Pharmacol, 660(1), 13-20. Physiological roles of the melanocortin MC₃ receptor. The melanocortin MC(3) receptor remains the most enigmatic of the melanocortin receptors with regard to its physiological functions. The receptor is expressed both in the CNS and in multiple tissues in the periphery. It appears to be an inhibitory autoreceptor on proopiomelanocortin neurons, yet global deletion of the receptor causes an obesity syndrome. Knockout of the receptor increases adipose mass without a readily measurable increase in food intake or decrease in energy expenditure. and finally, no melanocortin MC(3) receptor null humans have been identified and associations between variant alleles of the melanocortin MC(3) receptor and diseases remain controversial, so the physiological role of the receptor in humans remains to be determined. Ellacott KLJ, Morton GJ, Woods SC, Tso P, Schwartz MW (2010). Assessment of feeding behavior in laboratory mice. Cell Metab, 12(1), 10-17. The global obesity epidemic has heightened the need for an improved understanding of how body weight is controlled, and research using mouse models is critical to this effort. In this perspective, we provide a conceptual framework for investigation of feeding behavior in this species, with an emphasis on factors that influence study design, data interpretation, and relevance to feeding behavior in humans. Although we focus on the mouse, the principles presented can be applied to most other animal models. This document represents the current consensus view of investigators from the National Institutes of Health (NIH)-funded Mouse Metabolic Phenotyping Centers (MMPCs). Kennedy AJ, Ellacott KLJ, King VL, Hasty AH (2010). Mouse models of the metabolic syndrome. Dis Model Mech, 3(3-4), 156-166. Mouse models of the metabolic syndrome. The metabolic syndrome (MetS) is characterized by obesity concomitant with other metabolic abnormalities such as hypertriglyceridemia, reduced high-density lipoprotein levels, elevated blood pressure and raised fasting glucose levels. The precise definition of MetS, the relationships of its metabolic features, and what initiates it, are debated. However, obesity is on the rise worldwide, and its association with these metabolic symptoms increases the risk for diabetes and cardiovascular disease (among many other diseases). Research needs to determine the mechanisms by which obesity and MetS increase the risk of disease. In light of this growing epidemic, it is imperative to develop animal models of MetS. These models will help determine the pathophysiological basis for MetS and how MetS increases the risk for other diseases. Among the various animal models available to study MetS, mice are the most commonly used for several reasons. First, there are several spontaneously occurring obese mouse strains that have been used for decades and that are very well characterized. Second, high-fat feeding studies require only months to induce MetS. Third, it is relatively easy to study the effects of single genes by developing transgenic or gene knockouts to determine the influence of a gene on MetS. For these reasons, this review will focus on the benefits and caveats of the most common mouse models of MetS. It is our hope that the reader will be able to use this review as a guide for the selection of mouse models for their own studies. Ellacott KLJ, Murphy JG, Marks DL, Cone RD (2007). Obesity-induced inflammation in white adipose tissue is attenuated by loss of melanocortin-3 receptor signaling. Endocrinology, 148(12), 6186-6194. Obesity-induced inflammation in white adipose tissue is attenuated by loss of melanocortin-3 receptor signaling. Metabolic syndrome, a complex of highly debilitating disorders that includes insulin resistance, hypertension, and dyslipidemia, is associated with the development of obesity in humans as well as rodent models. White adipose tissue (WAT) inflammation, caused in part by macrophage infiltration, and fat accumulation in the liver are both linked to development of the metabolic syndrome. Despite large increases in body fat, melanocortin 3-receptor (MC3-R)-deficient mice do not get fatty liver disease or severe insulin resistance. This is in contrast to obese melanocortin 4-receptor (MC4-R)-deficient mice and diet-induced obese (DIO) mice, which show increased adiposity, fatty liver disease, and insulin resistance. We hypothesized that defects in the inflammatory response to obesity may underlie the protection from metabolic syndrome seen in MC3-R null mice. MC4-R mice fed a chow diet show increased proinflammatory gene expression and macrophage infiltration in WAT, as do wild-type (WT) DIO mice. In contrast, MC3-R-deficient mice fed a normal chow diet show neither of these inflammatory changes, despite their elevated adiposity and a comparable degree of adipocyte hypertrophy to the MC4-R null and DIO mice. Furthermore, even when challenged with high-fat chow for 4 wk, a period of time shown to induce an inflammatory response in WAT of WT animals, MC3-R nulls showed an attenuated up-regulation in both monocyte chemoattractant protein-1 (MCP-1) and TNFalpha mRNA in WAT compared with WT high-fat-fed animals. Voss-Andreae A, Murphy JG, Ellacott KLJ, Stuart RC, Nillni EA, Cone RD, Fan W (2007). Role of the central melanocortin circuitry in adaptive thermogenesis of brown adipose tissue. Endocrinology, 148(4), 1550-1560. Role of the central melanocortin circuitry in adaptive thermogenesis of brown adipose tissue. The central melanocortin 4 receptor (MC4R) plays a critical role in energy homeostasis, although little is known regarding its role in the regulation of adaptive thermogenesis of brown adipose tissue (BAT). Here we show using retrograde transsynaptic tracing with attenuated pseudorabies virus coupled with dual-label immunohistochemistry that specific subsets of MC4R-expressing neurons in multiple nuclei of the central nervous system known to regulate sympathetic outflow polysynaptically connect with interscapular BAT (IBAT). Furthermore, we show that MC4R-/- and agouti-related peptide-treated mice are defective in HF diet-induced up-regulation of uncoupling protein 1 in IBAT. Additionally, MC4R-/- mice exposed to 4 C for 4 h exhibit a defect in up-regulation of uncoupling protein 1 levels in IBAT. Our results provide a neuroanatomic substrate for MC4R regulating sympathetically mediated IBAT thermogenesis and demonstrate that the MC4R is critically required for acute high-fat- and cold-induced IBAT thermogenesis. Ellacott KLJ, Halatchev IG, Cone RD (2006). Characterization of leptin-responsive neurons in the caudal brainstem. Endocrinology, 147(7), 3190-3195. Characterization of leptin-responsive neurons in the caudal brainstem. The central melanocortin system plays a key role in the regulation of energy homeostasis. Neurons containing the peptide precursor proopiomelanocortin (POMC) are found at two sites in the brain, the arcuate nucleus of the hypothalamus (ARC) and the caudal region of the nucleus of the solitary tract (NTS). ARC POMC neurons, which also express cocaine- and amphetamine-regulated transcript (CART), are known to mediate part of the response to factors regulating energy homeostasis, such as leptin and ghrelin. In contrast, the physiological role(s) of the POMC neurons in the caudal brainstem are not well characterized. However, development of a transgenic mouse expressing green fluorescent protein under the control of the POMC promoter [POMC-enhanced green fluorescent protein (EGFP) mouse] has aided the study of these neurons. Indeed, recent studies have shown significant activation of NTS POMC-EGFP cells by the gut released satiety factor cholecystokinin (CCK). Here we show that peripheral leptin administration induces the expression of phospho-signal transducer and activator of transcription 3 immunoreactivity (pSTAT3-IR), a marker of leptin receptor signaling, in more than 50% of NTS POMC-EGFP neurons. Furthermore, these POMC-EGFP neurons comprise 30% of all pSTAT3-IR cells in the NTS. Additionally, we also show that in contrast to the ARC population, NTS POMC-EGFP neurons do not coexpress CART immunoreactivity. These data suggest that NTS POMC neurons may participate with ARC POMC cells in mediating some of the effects of leptin and thus comprise a novel cell group regulated by both long-term adipostatic signals and satiety factors such as CCK. Ellacott KLJ, Halatchev IG, Cone RD (2006). Interactions between gut peptides and the central melanocortin system in the regulation of energy homeostasis. Peptides, 27(2), 340-349. Interactions between gut peptides and the central melanocortin system in the regulation of energy homeostasis. Genetic and pharmacological studies have shown that the central melanocortin system plays a critical role in the regulation of energy homeostasis. Animals and humans with defects in the central melanocortin system display a characteristic melanocortin obesity phenotype typified by increased adiposity, hyperphagia, metabolic defects and increased linear growth. In addition to interacting with long-term regulators of energy homeostasis such as leptin, more recent data suggest that the central melanocortin system also responds to gut-released peptides involved in mediating satiety. In this review, we discuss the interactions between these systems, with particular emphasis on cholecystokinin (CCK), ghrelin and PYY(3-36). Ellacott KLJ, Cone RD (2006). The role of the central melanocortin system in the regulation of food intake and energy homeostasis: lessons from mouse models. Philos Trans R Soc Lond B Biol Sci, 361(1471), 1265-1274. The role of the central melanocortin system in the regulation of food intake and energy homeostasis: lessons from mouse models. A little more than a decade ago, the molecular basis of the lipostat was largely unknown. At that time, many laboratories were at work attempting to clone the genes encoding the obesity, diabetes, fatty, tubby and agouti loci, with the hope that identification of these obesity genes would help shed light on the process of energy homeostasis, appetite and energy expenditure. Characterization of obesity and diabetes elucidated the nature of the adipostatic hormone leptin and its receptor, respectively, while cloning of the agouti gene eventually led to the identification and characterization of one of the key neural systems upon which leptin acts to regulate intake and expenditure. In this review, we describe the neural circuitry known as the central melanocortin system and discuss the current understanding of its role in feeding and other processes involved in energy homeostasis. Ellacott KLJ, Donald EL, Clarkson P, Morten J, Masters D, Brennand J, Luckman SM (2005). Characterization of a naturally-occurring polymorphism in the UHR-1 gene encoding the putative rat prolactin-releasing peptide receptor. Peptides, 26(4), 675-681. Characterization of a naturally-occurring polymorphism in the UHR-1 gene encoding the putative rat prolactin-releasing peptide receptor. The rat orphan receptor UHR-1 and its human orthologue, GPR10, were first isolated in 1995. The ligand for this receptor, prolactin-releasing peptide (PrRP), was identified in 1998 by reverse pharmacology and has subsequently been implicated in a number of physiological processes. As supported by its localization and regulation in the hypothalamus and brainstem, we have shown previously that PrRP is involved in energy homeostasis. Here we describe a naturally occurring polymorphism in the UHR-1 gene that results in an ATG to ATA change at the putative translational initiation site. The presence of the polymorphism abolished the binding of 125I PrRP in rat brain slices but did not affect the ability of PrRP to reduce fast-induced food intake. Together this data suggest that PrRP may be exerting its feeding effects through a receptor other than UHR-1. Fan W, Ellacott KLJ, Halatchev IG, Takahashi K, Yu P, Cone RD (2004). Cholecystokinin-mediated suppression of feeding involves the brainstem melanocortin system. Nat Neurosci, 7(4), 335-336. Cholecystokinin-mediated suppression of feeding involves the brainstem melanocortin system. Hypothalamic pro-opiomelanocortin (POMC) neurons help regulate long-term energy stores. POMC neurons are also found in the nucleus tractus solitarius (NTS), a region regulating satiety. We show here that mouse brainstem NTS POMC neurons are activated by cholecystokinin (CCK) and feeding-induced satiety and that activation of the neuronal melanocortin-4 receptor (MC4-R) is required for CCK-induced suppression of feeding; the melanocortin system thus provides a potential substrate for integration of long-term adipostatic and short-term satiety signals. Halatchev IG, Ellacott KLJ, Fan W, Cone RD (2004). Peptide YY3-36 inhibits food intake in mice through a melanocortin-4 receptor-independent mechanism. Endocrinology, 145(6), 2585-2590. Peptide YY3-36 inhibits food intake in mice through a melanocortin-4 receptor-independent mechanism. Peptide YY(3-36) (PYY(3-36)), a peptide released postprandially by the gut, has been demonstrated to inhibit food intake. Little is known about the mechanism by which PYY(3-36) inhibits food intake, although the peptide has been shown to increase hypothalamic proopiomelanocortin (POMC) mRNA in vivo and to activate POMC neurons in an electrophysiological slice preparation. Understanding the physiology of PYY(3-36) is further complicated by the fact that some laboratories have had difficulty demonstrating inhibition of feeding by the peptide in rodents. We demonstrate here that, like cholecystokinin, PYY(3-36) dose-dependently inhibits food intake by approximately 20-45% over a 3- to 4-h period post ip administration, with no effect on 12-h food intake. This short-lived satiety effect is not seen in animals that are not thoroughly acclimated to handling and ip injection, thus potentially explaining the difficulty in reproducing the effect. Surprisingly, PYY(3-36) was equally efficacious in inducing satiety in wild-type and melanocortin-4 receptor (MC4-R)-deficient mice and thus does not appear to be dependent on MC4-R signaling. The expression of c-Fos, an indirect marker of neuronal activation, was also examined in forebrain and brainstem neurons after ip treatment with a dose of PYY(3-36) shown to induce satiety. The peptide induced no significant neuronal activation in the brainstem by this assay, and only modest activation of hypothalamic POMC neurons. Thus, unlike cholecystokinin, PYY(3-36)-induced satiety is atypical, because it does not produce detectable activation of brainstem satiety centers and is not dependent on MC4-R signaling. Ellacott KLJ, Cone RD (2004). The central melanocortin system and the integration of short- and long-term regulators of energy homeostasis. Recent Prog Horm Res, 59, 395-408. The central melanocortin system and the integration of short- and long-term regulators of energy homeostasis. The importance of the central melanocortin system in the regulation of energy balance is highlighted by studies in transgenic animals and humans with defects in this system. Mice that are engineered to be deficient for the melanocortin-4 receptor (MC4R) or pro-opiomelanocortin (POMC) and those that overexpress agouti or agouti-related protein (AgRP) all have a characteristic obese phenotype typified by hyperphagia, increased linear growth, and metabolic defects. Similar attributes are seen in humans with haploinsufficiency of the MC4R. The central melanocortin system modulates energy homeostasis through the actions of the agonist, alpha-melanocyte-stimulating hormone (alpha-MSH), a POMC cleavage product, and the endogenous antagonist AgRP on the MC3R and MC4R. POMC is expressed at only two locations in the brain: the arcuate nucleus of the hypothalamus (ARC) and the nucleus of the tractus solitarius (NTS) of the brainstem. This chapter will discuss these two populations of POMC neurons and their contribution to energy homeostasis. We will examine the involvement of the central melanocortin system in the incorporation of information from the adipostatic hormone leptin and acute hunger and satiety factors such as peptide YY (PYY(3-36)) and ghrelin via a neuronal network involving POMC/cocaine and amphetamine-related transcript (CART) and neuropeptide Y (NPY)/AgRP neurons. We will discuss evidence for the existence of a similar network of neurons in the NTS and propose a model by which this information from the ARC and NTS centers may be integrated directly or via adipostatic centers such as the paraventricular nucleus of the hypothalamus (PVH). Ellacott KLJ, Lawrence CB, Pritchard LE, Luckman SM (2003). Repeated administration of the anorectic factor prolactin-releasing peptide leads to tolerance to its effects on energy homeostasis. American Journal of Physiology - Regulatory Integrative and Comparative Physiology, 285(5 54-5). Central administration of a single dose of prolactin-releasing peptide (PrRP) causes a reduction in both fast-induced and nocturnal food intake and body weight gain. The aim of this study was to examine the effect of repeated administration of PrRP on energy homeostasis, including a measure of the expression of the mitochondrial uncoupling protein-1 (UCP-1) in brown adipose tissue. Conscious, free-feeding animals received central injections of PrRP (4 nmol icv) or vehicle. A single injection at 1000 caused a sustained hyperthermia over the 4-h test period and an increase in the expression of UCP-1 mRNA. Repeated, twice daily injection caused a reduction in body weight gain greater than that seen in pair-fed animals for the first 48-72 h. After 72 h, the animals became refractory to the actions of PrRP. The pair-fed group showed a reduction in UCP-1 mRNA expression at 48 h, which was reversed by PrRP treatment. This study indicates that PrRP exerts its effects on energy homeostasis in the short-medium term by reducing food intake and increasing energy expenditure. Ellacott KLJ, Lawrence CB, Pritchard LE, Luckman SM (2003). Repeated administration of the anorectic factor prolactin-releasing peptide leads to tolerance to its effects on energy homeostasis. Am J Physiol Regul Integr Comp Physiol, 285(5), R1005-R1010. Repeated administration of the anorectic factor prolactin-releasing peptide leads to tolerance to its effects on energy homeostasis. Ellacott KLJ, Lawrence CB, Rothwell NJ, Luckman SM (2002). PRL-releasing peptide interacts with leptin to reduce food intake and body weight. Endocrinology, 143(2), 368-374. PRL-releasing peptide interacts with leptin to reduce food intake and body weight. PRL-releasing peptide (PrRP) is a novel anorexigen that reduces food intake and body weight gain in rats. In common with other anorexigens, PrRP mRNA expression is reduced during states of negative energy balance, i.e. lactation and fasting in female rats. In this study, we examined the interaction between PrRP and the adiposity signal, leptin, which interacts with a number of peptidergic systems in the brain to regulate energy homeostasis. Intracerebroventricular coadministration of 4 nmol PrRP and 1 microg leptin in rats resulted in additive reductions in nocturnal food intake and body weight gain and an increase in core body temperature compared with each peptide alone. We show also, by quantitative in situ hybridization, that PrRP mRNA is reduced in fasted male rats and obese Zucker rats, indicating that PrRP mRNA expression, like that of other anorexigens, may be regulated by leptin. Finally we show, using immunohistochemistry, that greater than 90% of PrRP neurons in all regions where PrRP is expressed contain leptin receptors. Thus, we provide evidence for PrRP neurons forming part of the leptin-sensitive brain circuitry involved in the regulation of food intake and energy homeostasis. Lawrence CB, Ellacott KLJ, Luckman SM (2002). PRL-releasing peptide reduces food intake and may mediate satiety signaling. Endocrinology, 143(2), 360-367. PRL-releasing peptide reduces food intake and may mediate satiety signaling. PRL-releasing peptide (PrRP) administered centrally inhibits food intake and body weight gain. To elucidate the role of PrRP, its actions were compared with those of a homeostatic regulator of food intake, the satiety factor, cholecystokinin (CCK), and a nonhomeostatic regulator, lithium chloride (LiCl), which reduces food intake due to visceral illness. Immunohistochemical analysis of the protein product of the c-fos gene, showed that central administration of PrRP activated some areas of the brain in common with both CCK and LiCl administered peripherally. However, PrRP was more similar to CCK than to LiCl in its behavioral effects. PrRP did not cause conditioned taste aversion, but instead enhanced the normal behavioral satiety sequence. Furthermore, brainstem PrRP neurons were strongly activated by CCK, but not by LiCl. These data provide evidence that pathways from the gut to the brain that are involved in signaling satiety and visceral illness may have some independent components and suggest that PrRP may mediate some of the central satiating actions of CCK. Potter PGW, Walker JMV, Robb JL, Chilton J, Williamson R, Randall A, Ellacott KLJ, Beall C (2018). Recurrent hypoglycaemia increases human primary astrocyte oxygen consumption, fatty acid dependency and pentose phosphate pathway activity. Author URL. Robb J, Hammad N, Beall C, Ellacott K (2018). The 18-kDa translocator protein (TSPO) regulates cellular metabolism in astrocytes. Author URL. Walker JMV, Potter PGW, Robb J, Ellacott KLJ, Beall C (2017). Exposure of Astrocytes to Recurrent Hypoglycemia in Vitro Alters Gliotransmission and Purinergic Signaling. Author URL. Ellacott K, Cone R (2003). Immunohistochemical characterization of the proopiomelanocortin neurons in the nucleus of the solitary tract (NTS); a comparison with the arcuate nucleus of the hypothalamus. Author URL. Fan W, Ellacott K, Halatchev I, Cone R (2003). The melanocortin-4 receptor is important in mediating cholecystokinin-induced satiety. Author URL. 2018 Invited Speaker: Department of Pharmacology, University of Bath - Astrocytes and the regulation of feeding behaviour"
2010 Invited Speaker: Experimental Biology Annual Meeting; Anaheim, CA – Why is my mouse fat? - Assessing energy balance in the mouse. 2007 Invited Speaker: The Jackson Laboratory Discovery Strategies Conference: Modeling the human metabolic syndrome and type 2 diabetes in rodents; Bar Harbor, ME - The melanocortin-3 receptor null mouse – A model of obesity in the absence of metabolic syndrome. 2003 Invited Speaker: Digestive Disease Week; Orlando, FL – The role of the central melanocortin system in the regulation of food intake.